Welcome to part 3 of my Walk the Line series! 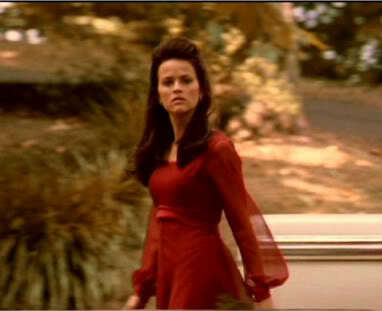 Since it is Fashion Friday, I thought that it would be an awesome idea to examine some of June Carter’s (Reese Witherspoon) famous looks throughout the movie, Walk the Line (2005). The movie moves primarily through the 1950’s to the 1970’s, and we get to see some awesome vintage looks this way. Not only am I showing you some of the movie’s iconic looks, but I also made Polyvore collages on how you can pull the looks off yourself! Here we see June from the beginning of the movie, wearing a beautiful red floral dress and sweetheart curls. Deep red and burgundy is on point for fall, and the sweetheart floral trend is perfect for a night out or church! Wear some coral lipstick for an extra pop of color. As the movie moves through the late 60’s, we see June’s hair getting longer and her fashion getting more stylish! As we head toward the colder months, we will need to dig our winter coats out of the closets (sad, I know), but refresh your late fall/winter wardrobe with a black and white plaid coat and some retro sunglasses! I seriously can’t get over the deep red dresses that June wears throughout the movie! She wears this during the scene at Thanksgiving. Maybe we can take some inspiration and do the same? Aren’t these dresses cute? Pair them with some black tights and flats and you will be good to go. Bonus points for long hair and a 70’s flower crown! I hope you love these looks and are inspired to maybe watch this awesome movie! Is there any June Carter fashion that you want to try? Share with me below!